I’m always on the hunt for interesting new planting combinations and garden features, especially those that lend themselves to residential scale landscape design. It’s easy to be inspired by magazine photos of estate gardens which have been professionally designed, installed, and maintained, but that type of garden is outside the reach of most people. So, when I find a garden space that I think really works, I like to examine it closely, to see what I can learn and apply in my own designs. 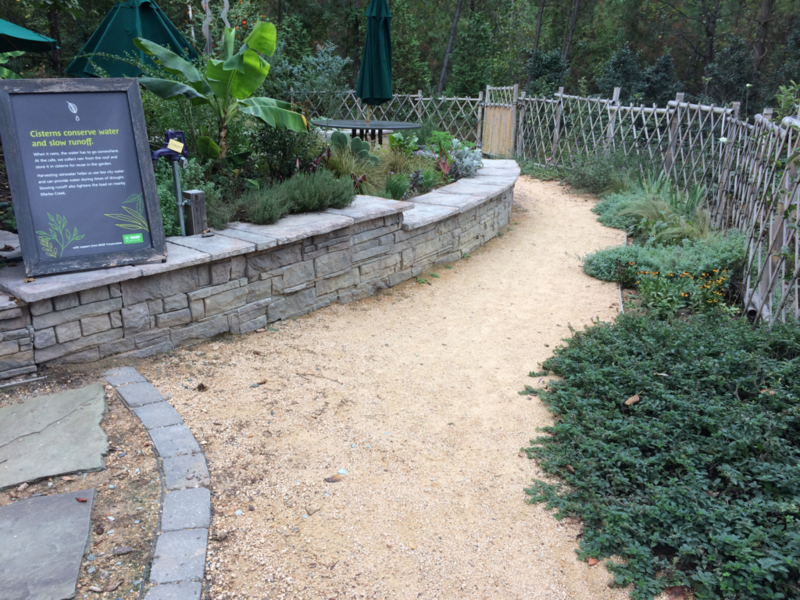 Read on to learn about one such space – the new herb garden at the Museum of Life and Science. 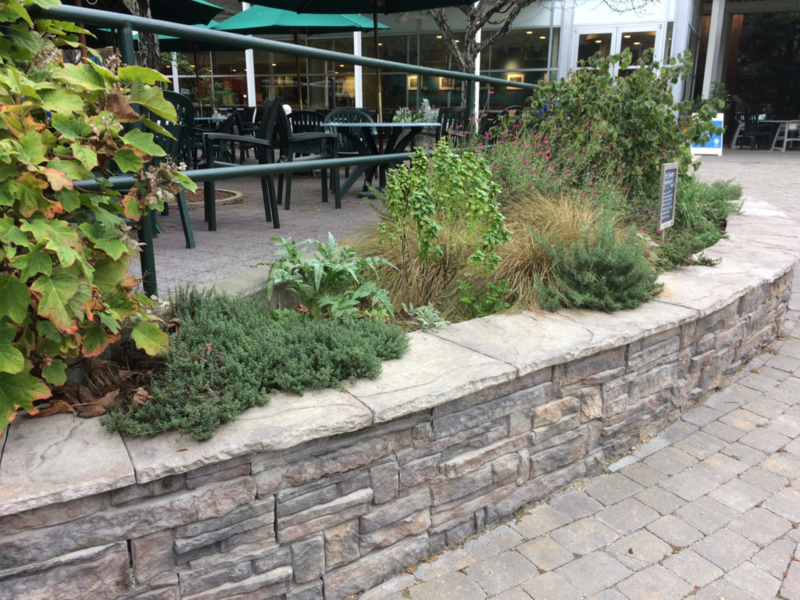 The herb garden is located adjacent to the museum’s café, with a combination of raised beds and in ground plantings. The bed lines are undulating with most of the bed spaces less than 6’ deep. Even in this relatively small space there is a good balance of seasonal interest and evergreen coverage, which is a tricky combination to achieve. Evergreen coverage is important for spaces which are seen on a daily basis throughout the year, but most people want their garden to change and evolve over the seasons. Another component that makes this space work is the strong textural contrast among the plants used. In the photo above, creeping thyme is planted between basil and an oakleaf hydrangea, with ornamental grasses contrasting with cascading rosemary. This garden manages to provide both year round and seasonal interest in a low maintenance space that would fit within most of my clients’ properties. Interested in creating something similar at your property? Contact Bright Leaf Landscaping at 919-619-4460 or fill out our online contact form. Design and installation are our expertise, and we always enjoy meeting with new clients to discuss potential projects!